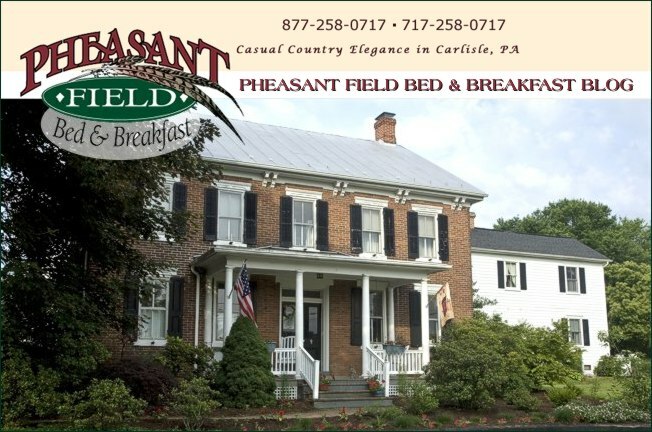 Carlisle, PA - hometown of Pheasant Field B&B - has many wonderful restaurants! The choices of restaurants are very impressive for such a small town. We have Japanese, Thai, Italian, Organic, Steak & Seafood, British Pub (making their own brew), and Greek. For lunch, try Market Cross Pub or Back Door Cafe for great sandwiches and salads. The Hamilton Restaurant is a favorite of Dickinson students and alumni as well as locals who go for the famous "hotchie dog". For dinner - wow, the selections are almost endless! Great Italian food is served at Rillo's and Piatto. Wonderful Belgian food and beers are offered at the newest restaurant in town, Cafe Bruges. If you have a taste for Oriental foods, try Mount Fuji for Japanese, Amy's Thai for favorites from Thailand, and for a Vietnamese flavor, got to Issei Noodle. There is also Mexican food and excellent "diner food" in the Carlisle area. We even have a restaurant that specializes in Organic offerings served up with Jazz! Come to Carlisle, PA for many great dining experiences and a wonderful getaway.